At the special request of my husband, who could think of no better Father's Day gift than being able to go to a restaurant on a Sunday, we hit up Herm's Inn for lunch on Father's Day. 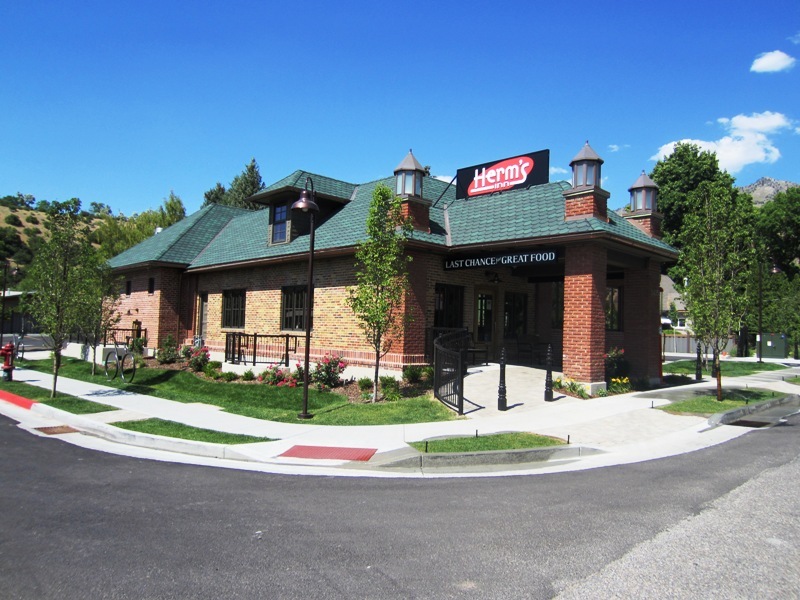 Herm's is one of the newest restaurants in Logan, and features a diner or roadhouse-style menu. It's located at the far east end of Canyon Road, right before the road enters Logan Canyon and approaches First Dam. 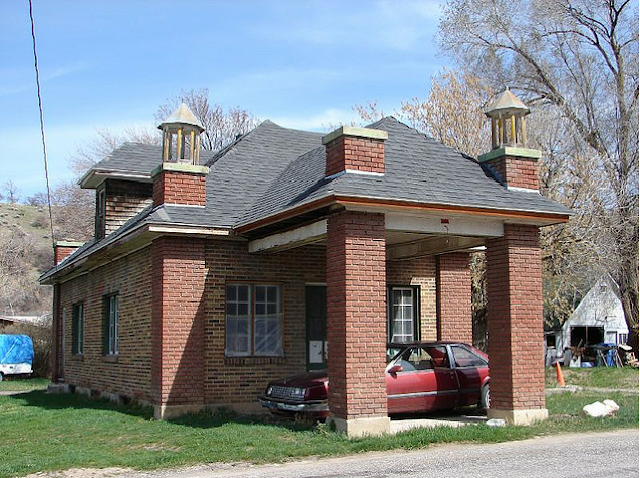 The breakfast-and-lunch spot is housed in an old service station that sat abandoned for more than 60 years before being bought and renovated by successful local businessman Jim Laub of Cache Valley Electric. And renovated it was! Just take a look at the "before" photo and compare it to my photo, above. Photo copyright 2007, Heinz J. Mahler. Used by permission. The architect and interior designer behind the project was acclaimed Bountiful, Utah designer Robert McArthur of Robert McArthur Studios. He's worked on some great projects, including gorgeous homes, a few LDS temples, and the Cache Valley Electric corporate headquarters. If you're interested in learning more about the renovation process and seeing tons of beautiful professional photos of the construction process and interior and exterior details, click here for posts about the Herm's Inn project on Robert's blog. In addition to being renovated, the building was expanded significantly. ADA-compliant restrooms were added, as well as a second dining room that features huge windows that open up for an indoor-outdoor feel. New footings were poured and the basement was made usable as reception and meeting space. If I understand correctly, the renovated building was leased to a couple of restaurateurs hand-picked by Jim Laub. Ryan Bird and Heather Santi, who own and manage Herm's Inn, are also involved with Salt Lake City's popular breakfast and lunch spot, Eggs In The City. New restaurants in Logan always have a lot of buzz around them when they open, but Herm's location, building, and players combined to create more than just buzz -- almost a deafening roar. 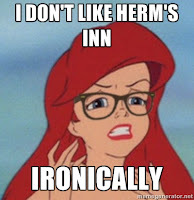 The question on my mind was, would Herm's Inn live up to the hype? Read on for my verdict. First, the details. FYI: Free Wifi. Reception and meeting space available. Please note that the parking lot is small. Be courteous to the neighbors and park in the overflow lot down the street. The at Herm's Inn menu seemed pedestrian at first, and featured typical breakfast and lunch fare: omelets, pancakes, burgers, salads. The casually-dressed waitstaff was friendly and proficient but harried on a busy Father's Day Sunday, and we waited nearly 40 minutes for our food. 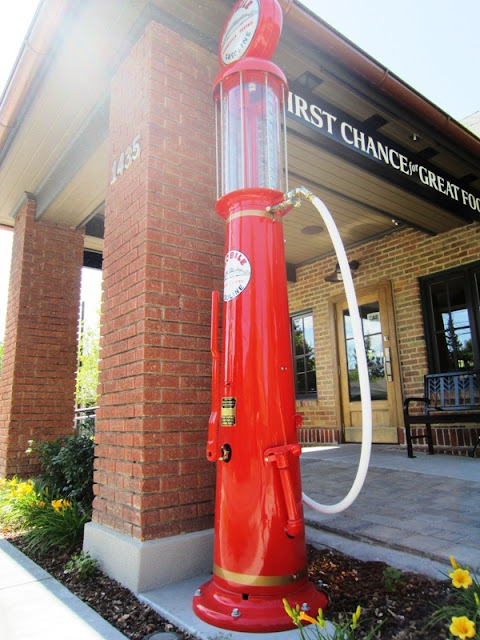 We were getting worried that Herm's Inn was all buzz and no honey, and that we would be leaving disappointed and writing off the hot new eatery housed in a cool old gas station. But then our food arrived. From the first bite, all our fears and frustrations were erased. A juicy burger on an airy house-made bun. A Cobb salad filled with chunks of tender grilled chicken. A pile of can't-miss fried potatoes. Macaroni and cheese I wanted to steal from my two-year-old. Diner food, elevated. Thank you, Herm's Inn. Drink prices are steep at $3.00, but refills are included. The rest of the menu is at an excellent value point considering the quality ingredients and generous portions. The restaurant is young, and I expect they will continue to work out service and staffing kinks to make wait times more reasonable. I'll definitely be back for more. We arrived a little after noon on Father's Day. 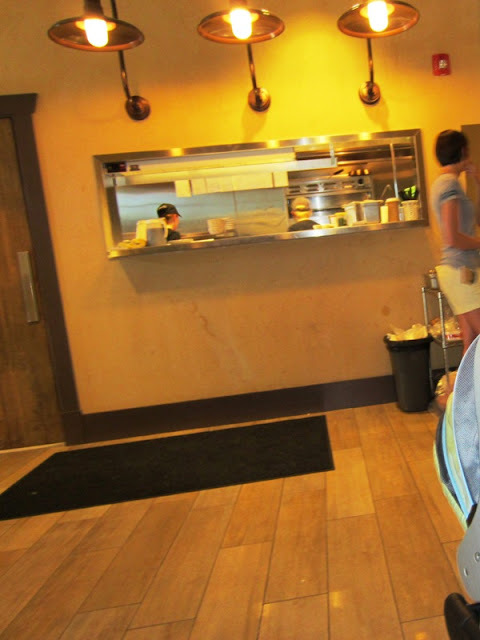 It was clear we weren't the only people in town who thought Dad might like lunch at Herm's. There were several parties waiting for tables. The weather was fine and porte-cochere provided plenty of shade, so we settled in for a wait and enjoyed looking at the details of the renovated gas station. Eventually we were seated by a friendly young hostess. We were given what I would say was the worst table in the house, but in our circumstance it was the best table in the house and I think they gave it to us out of compassion for us and our fellow diners. We were seated between the kitchen and the busy bar area, conveniently near an overflowing garbage can. High noise, high traffic. Why would I say this was the perfect table? We were dining with out four-year-old, two-year-old, and sixth-month-old stroller-bound baby. We were far enough from other diners that we couldn't bother them. The noisy kitchen covered the sounds of our children's hungry cries, and we used that garbage can a few times throughout the meal. The building is strikingly designed, and it seems no expense was spared. Tables were custom-made in a French industrial style, Tolix chairs sit at all the tables, and custom exposed-bulb light fixtures point to the profession of building owner Jim Laub of Cache Valley Electric. The booths even have their own electric outlets so people can plug in and enjoy the free Wi-Fi in the restaurant. Clever art covers the walls: among other things a cardboard deer head, caricatures of eminent Loganites of days gone by, and an upside-down sign that says "Easy" (as in eggs over-easy). It's easy to feel hip and cool when you're dining at Herm's. But then we were given our menus and that feeling of hipness ended. Everything listed seemed like completely typical diner fare, at prices a dollar or two above typical diner prices. (With the exception of beverages, which were steeply priced at $3 each.) Biscuits and gravy, pancakes, omelettes, eggs benedict, and french toast were some of the selections on the breakfast side of the menu. The lunch items included burgers, sandwiches, salads, and macaroni and cheese. Nothing seemed all that interesting. When our waiter came to take our order we announced our selections: a burger for me, with cheese and bacon, a Cobb salad for Tyson, and kids' meals with macaroni and cheese and a quesadilla for our boys. That's when the waiting began, though not the anticipation. We weren't in anticipation because our selections seemed so boring. The only thing that really caught my eye were a few variations on Eggs Benedict like the Macho Benny - poached eggs on a corn tortilla with chorizo, black beans, avocado, and chile verde. There was also a Macaroni & Cheese of the day, but that day's version was jalapeno, so I looked elsewhere. Tyson noted that it was really difficult to tell the employees from the customers. It did add a nice, laid-back feel to the place, but everyone was dressed very casually. The best way to distinguish employees from customers was by observing who walked behind the counter. And we had plenty of time to observe. The minutes ticked by. Our waiter checked back on us often, and refilled our drinks, but the wait time stretched and stretched until it had been almost 40 minutes since we'd ordered, and nearly an hour since we'd arrived at the restaurant. Our little natives were definitely getting restless. They dug all the ice out of their drinks. They each got to eat a packet of jam. They started to cry. One went under the table and refused to get back in his seat. We began to seriously doubt our choice of restaurant. A man who wasn't our server approached our table and apologized profusely for the wait. He explained that several of the kitchen workers were new and the restaurant was so busy that day. We asked for some potato chips for our children (potato chips were to accompany their meals), which he promptly brought on a large plate. That's when things started looking up. That's the guy who brought us our potato chips. Turns out he's owner/manager Ryan Bird. You really should check out his mustache. After the potato chips it wasn't too long before our food arrived. It definitely looked more appetizing than I was expecting. My photos don't do the food justice, but here are our plates. Seeing the oozing, perfectly-melted cheese on my burger, the thick-cut bacon, and the fresh tomato and lettuce, I began to reconsider my apprehension. One bite erased all my fears. This. This was food worth waiting for! My burger was beefy and juicy. The bacon had just the right amount of crisp, just the right amount of tender. The soft, house-made bun gave easily at my bite. Then I tried the potatoes. Heaven! Gently charred and expertly seasoned, the potatoes actually managed to grab my attention from the burger. I was enjoying my food so much I found myself facing my favorite food-related dilemma: whether to hoard or whether to share. The food is so good you want to keep it to yourself, but it's so good you also want others to experience the joy of its goodness. Tyson didn't want any of my burger, but he did let me have a bite of his salad, which included a generous amount of chicken he described as, "Real. Really good grilled chicken. Like, done right," and perfect proportions of greens, tomatoes, hard-cooked egg, bacon, avocado, and blue cheese. Somehow even the quesadilla was better than other quesadillas. And the macaroni & cheese. Oh, the mac & cheese! It was sharp and mild and gooey and saucy all at once. In fact, when I started writing this review several days ago I still had a tiny cup of leftovers in my fridge. This picture made me run and warm it up the second I saw it. Yes, I stole my two-year-old's leftovers. Perhaps I was really hungry (I was). Perhaps I am being overly rhapsodic (yeah, maybe I am). But that food seemed so good! A closer reading of the menu revealed a few clues I missed the first time. Clues that I would like what I was going to be served. The words house-made recur again and again. House-made biscuits, house-made sausage, house-made buns, house-made syrup. Local ingredients, like the cheese that graced my burger, are used whenever possible. Thought and care went into this food and this menu. Come to think of it, thought and care went into this building. Thought and care went into the preservation and enhancement of the past. Thought and care went into the idea that Logan's one little special neighborhood, "the island", could support a restaurant. I thought the food was going to be boring, but after tasting it I don't know if I care to ever eat fancy food again. Welcome to Logan, Herm's Inn. http://pantraya.blogspot.com/2012/03/herms-inn.html - Fun photos of artwork, etc. P.S. 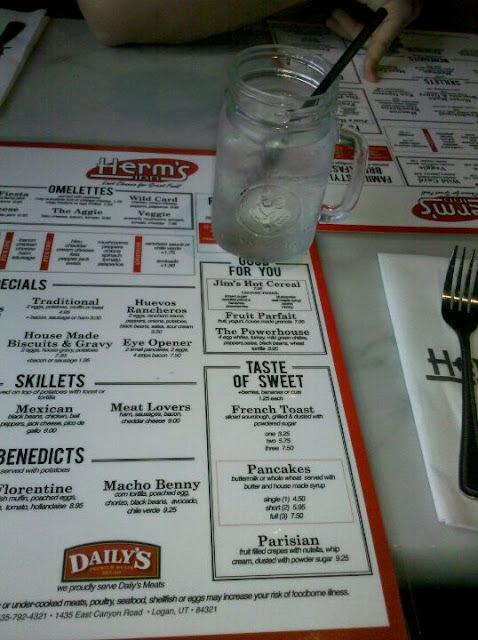 : I don't think I'm the only one who noticed Herm's has a decidedly hipster thing going on. Check out what I found when I did a Google image search for Herm's. 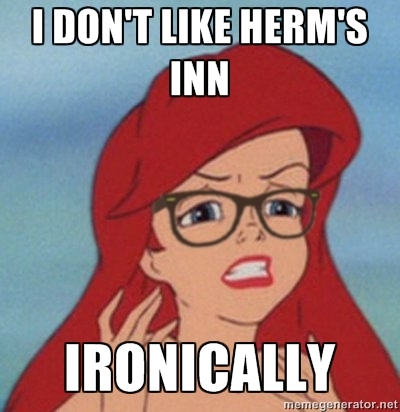 Hipster mermaid meme doesn't like Herm's?!?! So, have you been to Herm's? What was your take? And, was this review way too long to read? I like your reviews Lisa... very honest and up front. Not overly negative or positive.. Actually believable!! And I knew I had seen Herm's before!! It really resembles the Cache Valley Electric Building! Beautiful!